In fact, I had not heard of the French country classic until this movie and as soon I saw it (with much laughter and warm fuzzy feeling), we went hunting for French bistros that served the dish. Well, in NYC, you are apt to bump into every style of French cuisine; from rustic to haute couture! So, we ended up in this little cafe that we now simply, simply love - Cafe Henry in the Village. They serve the rustic version (like the one Ego had in this childhood) wrapped in crepes with or without meat. It's delicious and satisfying! However, I am yet to find a place that serves the fancy version that Emile executed. Evenly spread the tomato sauce as a base at the bottom of a 8 inch oval baking pan. Using a mandolin (careful!) 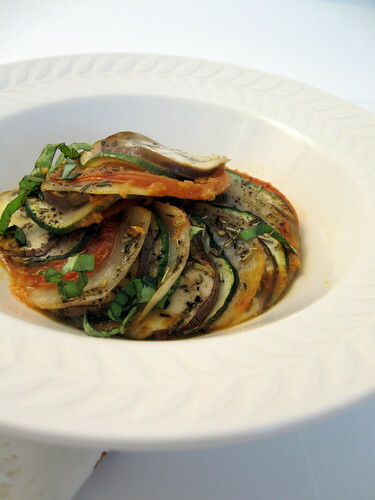 thinly slice all the vegetables. In my experience, it is easier to cut the soft fleshed veggies, like egg plant and tomato, with a knife rather than a mandolin. Arrange the veggies, in an overlapping fashion, alternating all the vegetables, around the circumference of the pan. Fill the entire dish with the overlapped pieces. Brush the top with the olive oil. Season with salt, pepper and Italian seasoning. Cover the pan with foil. 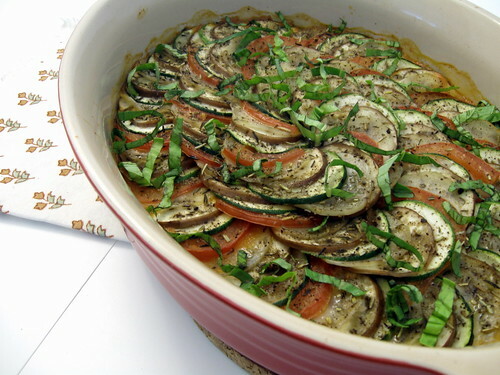 Bake at 350F for 30-35 minutes, until the zucchini is translucent. Let rest for five minutes, unwrap and serve with sauce.